This Graham Cracker Waffle S’mores Cake is beyond a gorgeous brunch offering! 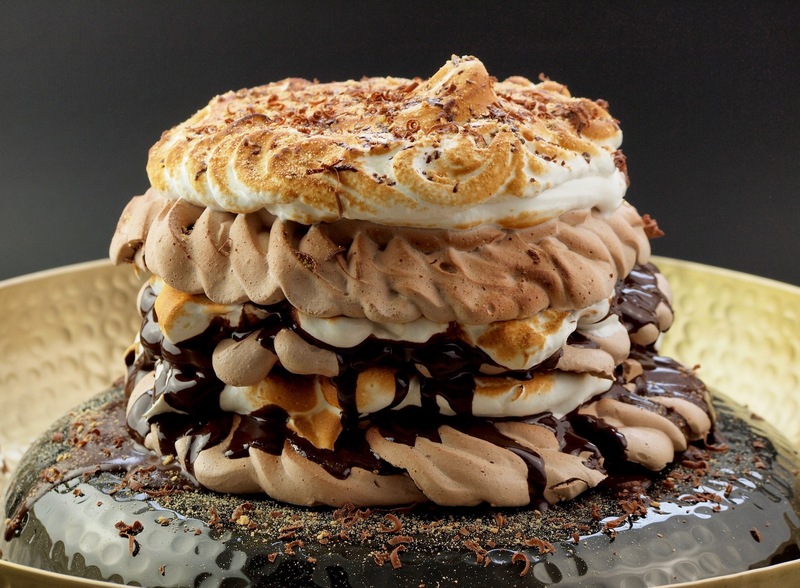 It’s a cinnamon Belgium Waffle baked in a Chocolate Pavlova, drizzled with chocolate, and topped with ooey gooey brûléed meringue. Preheat oven to 250 °F. Line baking sheet with parchment paper. Trace three 8-inch cake rounds on the parchment paper. Set aside. Make Graham Cracker waffles. Preheat your waffle iron while preparing the batter. In a medium bowl, whisk together flour, brown sugar, baking soda, baking powder, salt, and ground cinnamon. In a large bowl, whisk together buttermilk, egg whites, melted butter, and vanilla until combined and then whisk in the dry ingredients. When the ingredients are thoroughly incorporated. Scoop batter into your waffle maker and cook according to manufacturer’s instructions. The recipe should yield three 8-inch waffles. Place on the prepared sheet tray. Make the chocolate Pavlova in the bowl of a stand mixer fitted with a whisk attachment. Beat egg whites at medium speed until stiff peaks, about 4 minutes. Add sugar one tablespoon at a time. Once all the sugar has been added, increase speed to medium-high. Continue to beat until stiff peaks. At this point, the meringue should be thick and glossy. Lower the speed to low and slowly add in cocoa powder, cornstarch, and vinegar and mix until there are no longer any streaks of cocoa powder. Fill your piping bag with chocolate Pavlova mixture and divide evenly between your circles, start piping around the waffles. Start from the bottom and continue around the waffle, moving up a layer until waffle is covered, but be sure to leave a “vent” hole in the Pavlova top to let the waffles release any excess moisture while baking. Bake for 60 minutes; do not open oven until the hour is up. Then, check the pavlova to see if done. You will know the pavlova is done when it feels dry and is slightly cracked on the outside. Turn off oven and allow to cool in oven with the oven door propped open. Once the meringue has cooled, melt the dark chocolate bars in 30-second increments in the microwave, stirring between cooking time until melted. When melted divide the chocolate between your two waffle pavlovas by evenly drizzling across the top. Allow to cool while preparing the meringue. Fill a saucepan with about 3 inches of water. Make sure the bowl of your standing mixer fits on top of the pan without touching the water. Then bring your saucepan of water to a boil. With a hand mixer, whisk the egg whites and the sugar in the bowl. Place it on the pan that’s over the boiling water (over medium-high heat). Whisk constantly for about 5-7 minutes, until the mixture reaches about 140°F. You can use a candy thermometer if you have one, or even a meat thermometer to measure the temperature. Immediately transfer the mixture to a stand mixer fitted with a whisk attachment. Add vanilla extract and beat at high speed for until stiff peaks form, about five minutes depending on your mixer (note, you can continue to whisk with hand whish, but it will take a long time). Your meringue is now ready! Spread the meringue over each layer of waffle pavlova. Carefully stack the waffle pavlovas and then lightly brûlée with a kitchen torch. Serve topped with shaved dark chocolate or drizzled with melted dark chocolate and then sprinkled with crumbled Graham crackers.